The slight risk of severe storms for our region plus the watches and warnings that have already fired up in Pennsylvania are enough to prompt the need to babysit the radar. As of my post time, there was a Watch Box for PA and isolated warnings, included a Tornado Warning just south of State College set to expire at 2 PM. But there was a history of large hail with that cell. A line of storms farther south was breaking up nee Hancock, MD and along I-81 from Martinsburg to Winchester and Front Royal. This is expected to not be a factor for long as our cool, damp marine layer is battering this down. But the front with more force should arrive this evening. 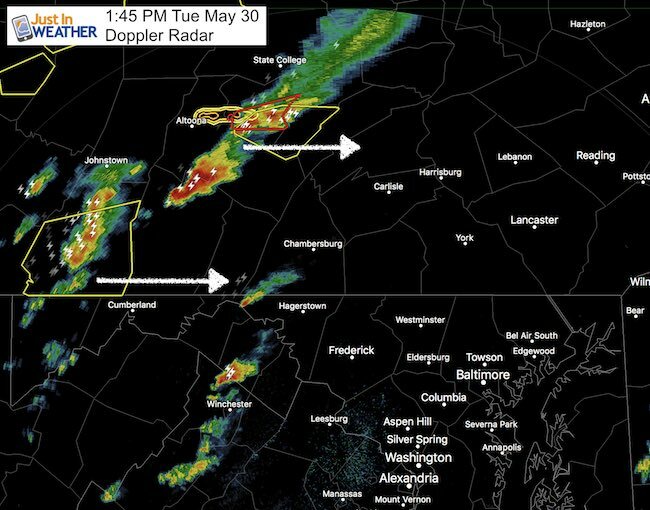 Below is the radar simulation showing that our region should start to watch for showers and storms by 5 and 6 PM and spread through central Maryland and the Eastern shore this evening. This is NOT perfect, but the best gauge to track the activity for the next few hours ahead. Also allowing us parents and coaches to plan for potential rain delays in today’s games.